The police physical test, which is also known as the physical ability test (PAT), is a highly regulated selection process that requires some form of preparation in order to pass it. Similar to that of the Chicago Police Department physical fitness requirements, recruits will be tested on a wide array of different exercises. In as much as you carry a firearm, you aren’t allowed to discharge it when pursuing a suspect, unless he/she possess immediate harm to you or the public. So, your ability to subdue a suspect without using deadly force will probably depend on how good of a shape you are in. Are you already getting the gist of this test? As a law enforcement candidate, you must satisfy all police fitness requirements before moving forward in the hiring process, to ensure that you are capable of handling the physical demands of the job. That’s why if you’re out of shape, we highly recommend following a police officer preparedness program at least 8-12 weeks in advance before your test. So, what physical challenges could these be? Just in case this thought hasn’t crossed your mind yet, you are entering an extremely deadly profession, with staggering physical demands on a nearly daily basis. 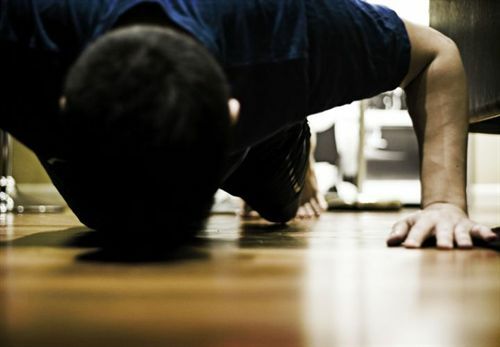 Your day won’t be spent doing pushups, pumping iron, or swimming laps. Instead, you will have to chase villains, scramble through yards, sprint down streets and alleys, jump fences at a dead run speed, climb chain link, evade fists, knives, dogs, bullets and anything else that you are attacked with, and struggle to handle combative suspects who are possibly under the influence of alcohol and drugs. When working, you won’t be dressed in a comfy sweat suit with a bottle of water at hand and a nice shower waiting for you after the highly engaging session. On the contrary, you will have to run, sprint, and jump while wearing several pounds of gadgets, and only get to drink some water or take a shower when your shift is over. As such, you can’t take police fitness tests lightly. Many officers lose their lives every year, in the line of duty, and an equally large number face risk factors for physical disability, back injury, and even cancer. The police physical fitness test just like one conducted by the Illinois State Police checks for strength and stamina, so you must be more than strong, highly fit, and extremely motivated. You have to perform as though your life and that of others depend on you. It is an endurance battle, but on the day of the test, you have only your life as a continuing candidate to save. When preparing to take the police academy physical test, you will probably find it easier to pass if you prepare by practicing those exercises you expect, and working to improve your upper and lower body strength, as well as your cardiovascular endurance. Usually, the specific police fitness test requirements vary from one state to the other, though their objective remains the same: to push your body, reflexes and instincts in order to demonstrate agility and swift movements as required. So, your department will have prepared the activities to use in the test. As I mentioned before, the physical requirements for law enforcement aren’t the same for all states, so you should find out the fitness skills included in your department’s physical police test. Simply visit the State Police website or that for Public Safety to find out the specific police physical requirements in your agency. It’s not recommended that you start preparing for let’s say the police academy physical fitness test for your state if you aren’t sure what exactly you are going to be tested on. You’ll have a better outcome if you know what exercises are part of the exam. If a website isn’t available, call the department and inquire for any materials they may have on the test. Some agencies like the Baltimore County Police Department provides training tips on how to prepare for the physical agility test. Even better some departments like that of the Miami Police Department hands out an entire workout routine handbook/Manual that you can download online for free. So, is there a typical criteria for physical assessment tests? Physical ability testing: the 1.5 mile run must be completed within a set time frame, usually in the range of 16 – 21 minutes. This is usually the first test. So, unless you finish within the designated time frame, you won’t proceed with other tests. Pursuit runs may also be included, whereby the candidate has to sprint from standing, for a distance of 60 – 100 yards, with a passing time of 65 – 85 seconds. While this isn’t an obstacle race, a fence climb may be included. Obstacle courses: these are extremely demanding, as they are designed to assess many scenarios of suspect pursuits and your ability to chase and restrain a suspect. I suggest you check with your department to see whether their course is available for training. If it’s not available, you can get a diagram of it; find a nice spot to set u a similar structure, and practice, practice, practice. Typical obstacle courses require you to cover about 400 yards in less than 4 minutes, whereby you do short sprints, stairs, and lift/drag distances. You may also be required to dodge swinging objects, climb through windows, climb ladders, and crawl through pipes, in addition to wearing a 3 pound vest or other weighty item. Calisthenics assessments: this is the third test criterion for law enforcement physical fitness standards, and includes test like push-ups, bench press, sit/reach extensions, and sit ups, each of which is scored differently. Once you know the physical fitness requirements for police officers that will be tested in your department, start your training. You will have to come up with training and dieting programs, but before that, talk to your physician for guidance in attaining a suitable health and fitness level. Considering the nature of the physical requirements for police academy tests, I suggest you start your training as early as six months before the test date. You may be asked to push a bench weight that is equivalent to your weight. So, if you weigh 180 pounds, you will have to start your training early, to build your strength gradually. Include several aerobic activities, like swimming, jogging, and walking, and time yourself to ensure that you build your endurance. The day before your physical test for police, relax and take things easy. Don’t overwork your muscles as fatigue may keep you from performing well. Get enough rest at night to relax your muscles, and have a good breakfast to ensure you have enough energy to do whatever it takes to fulfill the police academy physical requirements. Go to the challenge with a clear head, lots of energy, and high expectation of excellence. You need to prove beyond doubt that you can handle the daily physical requirements for police work, and perform as required. i have not ran long distance in a long time.My test is this Saturday coming up.I need to accomplish it under 17 min 16.57 to be exact ,after that a three hundred meter run.I guess my question is how to I pace myself.Should I drink a energy drink keep up my endurance.